Home » Inspiration » Dear Rebbetzin Heller: Am I Allowed to Be a Happy Older Single? Dear Rebbetzin Heller: Am I Allowed to Be a Happy Older Single? I’ve read a lot of Rebbetzin Tziporah Heller’s books, and my reaction is always the same: “How did she get to be so smart? So wise? 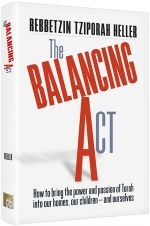 So constantly RIGHT ON?” Here’s an excerpt I love from her newest book, a collection of questions and answers called The Balancing Act: How to Bring the Power and Passion of Torah into our Homes, Our Children–and Ourselves (Shaar). Even though Rebbetzin Heller’s response is addressing an older single, I think that what she says about feeling joy during life’s tests is excellent advice not only for the older single, but for every single one of us. I’m single, in my 30s, and unemployed. I am looking for ways to increase my simchah (joy) and to be less controlled and defined by my external reality. Can you explain what simchah really is? How can I cultivate the spiritual courage to be happy? Often the test itself is not the hardest part, but people’s reactions. They often misinterpret my attempts at being happy as not dealing with my life. Doesn’t Hashem want us to do what’s within our power and trust Him to do the rest? People tend to forget that Hashem really is in control. Therefore, when they see you happy, they think you’ve somehow relinquished mastery over circumstances that are not really in our hands. For the world to fulfill its destiny, we must find Hashem within all the myriad shades of reality, whether they’re pleasant or difficult. A person who is b’simchah is in essence saying, “Not only is this good, but it’s the best that could possibly be.” Genuine simchah is the smile on your face when the whole world thinks you’re strange for being happy. Although I have never stood in your shoes, I don’t think any test in life is harder than being single at 28 or older. I’ve seen people suffer through illnesses, terrible bereavement, and awful tragedies, but I still don’t think there is anything as painful. The level of loneliness, despair, and the complete lack of sympathy has no parallel. Yet I’ve known people who were happy during these years because they used every day constructively and joyously. These are the people who were never in galus (exile). You don’t have to choose to be there [either]. Keep smiling, stay upbeat, don’t waste a moment, and you’ll ultimately find your point of redemption. OMG! Is she for real?? ?Why 28? And if you’re 27?! How dare she claim that the pain of being single is harder than the pain of bereaved parents??!!! I’ve never heard of this Rebbetzin Heller but I am a bereaved mom and I don’t wish my worst enemy the pain I went through and still live with.I was not single at 28 either but know many people who are and there is absolutely no comparison. I think she should retract this insulting, hurtful statement. Dear Laura, I am so sorry to hear about your tragic loss, I cannot imagine the horrific pain and suffering you and your family have experienced. Possibly she is saying that even though the pain of older singles should be less than other kinds of suffering, because of the loneliness and complete lack of sympathy, that makes the pain unbearable. Whereas people experiencing other kinds of suffering ( such as illness and grieving) tend to receive sympathy and support from community and family members. May G-d provide you and your family comfort from your unfathomable loss. I am not sure about the comparison Rebbetzin Heller mentiones, but I can very much relate to the advice she is giving. I was single till the age of 29 and the truth is that despite the great family support I had, the fulfilling job I loved and the nice Jewish community that surrounded me I felt terribly lonely and truly hopeless. Compared to my situation today (I am 34, married to a great man, who is the father of our two great daughters) I realise how being single ment feeling lack of the support and stability I feel today, constant feeling of void and tremebdous effort to maintain hope things will get better. At the same time, though, I realized – even then (!) – that the fact I was single allowed me to spend 3 years abroad (including Israel) studying Judaism and later on engaging in my teaching proffession in a way I would hardly be able to do if I had a family on my own. The truth is, however, – and I knew this the whole time I was single – that I saw this time on my own as a blessing only thanks to the fact I managed to maintain a strong hope this was a “temporary state.” There are many in their 30s or even 40s or 50s who stop seeing the light at the end of the tunel and lose this hope. This must be a true test of personal ability to find simcha in their life. I agree with Laura, I’m quite shocked at the Rebbetzin’s statement. It seems so incredibly callous and offhand, which does not line up at all with her usual sensitivity and insight that she is so well known for. To judge her favourably, I think what she was referring to was the fact that older singles are usually blamed for their situation, it is their “fault” because they aren’t “trying hard enough” or are “too fussy” etc etc…. and the longer it continues the worse the gossip gets, they are pointed at and whispered about…. so it is a very lonely suffering whereas other trials and tragedies are somewhat cushioned with compassion and communal support from others (not that this is any kind of comfort). However, having said that, to make such a statement is truly shattering for all those who have suffered. TO be fair, It is also stated from within a specific community. In no way would Rebbetzin Heller be making that statement as a general rule. Perhaps we need more context for the statement. Could we get more of the article? I also find the quote surprising. I almost began to compare tragedies as well, but let’s not. I assume she is trying to show she empathizes with this girl’s situation. I wish her all the bracha I can in hiding her beshert, I would like to see more of the story though. this is the entire article– except for a few lines about the Jews being redeemed from Egypt after they attained simcha. In general, comparing and contrasting pains serves no good purpose. Pain is pain, loneliness is loneliness. No matter what hardship we go through, we share the same feelings. Please G-d, take us ALL out of Galus, because You know that we’re ready!! Thankfully I have not experienced severe illness or death of a child, chas v’shalom, but I HAVE been single at age 30. That was the absolute worst misery in my entire life. I cried and cried out to Hashem to beg to find my zivug like I had never cried out in my life. B”H Hashem did answer my tefillot and I met my husband soon after I begged with all of my heart. I was so, so, so lonely and desperate. I had anxiety and depression. I will never, ever forget that time in my life. That misery did serve a purpose, however; I will never completely take for granted my marriage. Even when times are tough in my marriage, deep down I am grateful for the love, support, companionship and stability my husband provides me. I would never like to go back to that place. Hope this helps some to understand the Rebbetzin’s statement as it resonated with me. After many years of searching, and not only for an husband, I got b’h married at the age of 36! I went through many confusion periods, dissapointments, and hard times but deep inside always believed I would one day have a family. I remember many times being very lonely, spending again a shabbat alone…..I remember the day it was getting too much and felt so lost..and then Hashem sent me my beshert! My youngest son was born when I was 41. Understanding the pain and fear from singles I really think it can never ever be compaired to the pain of losing a beloved one. A husband can always appear a minute from now, but a loved one who died does not appear again untill the coming of the Mashiach. Wishing everyone an easy fast! I have been reading Rebbetzin Heller’s words for many years, and to call her callous is absurd. Listen to her words again. The Rebbetzin is not speaking out of ignorance or lack of experience. It’s not theoretical or something she read. Let me try and explain. When a person loses a loved one, they sit shiva and comforters come and try to ease their pain. There is no question, the pain is deep, scarring and enormous. But what of the person who has a pain where there is no shiva, what comfort do they ever get. When is their grief over? For them, tomorrow is not going to be brighter, their pain will not ease nor fade and they are reminded constantly of their lack. There are books and books written to help a mourner through their anguish, and again, their anguish is real and devastating. But there are answers and ways to think about what they have experienced that helps them through. I don’t wish either pain on anybody, and please G-d soon, all sorrow will cease. I only said it seemed callous, not that it was….. I was replying to someone who was clearly in deep pain over the rebbetzin’s words: I also mentioned how normally sensitive the rebbetzin is, and tried to judge her meaning favourably, twice …… amazing how one word can cause such an effect. I have also been reading her books for years and even met her personally. I will try to be more careful with my comments in future…. My deepest sympathies to the first poster. I agree, there was no need to compare. It was clearly hurtful. For such tragedies as yours, what can we say except that Moshiach should come speedily and reunite us with all of our dearly departed.